1. 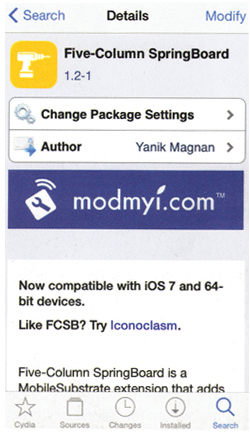 First you need to install Five-Column Springboard from Cydia, if you experience problems finding it try featured section under Icon Customisations. You need to restart Springboard after installation is complete. 2. If you see no changes on the home screen, tap the Settings app icon and scroll down to Five-Column SB. 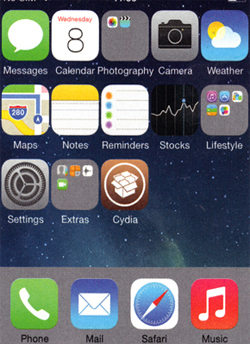 If there are other apps and tweaks installed Five-Column SB will be listed with them. 3. 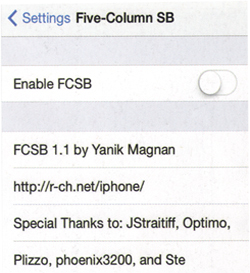 The option will appear on the screen and tap the slider of Five-Column SB to activate it. As expected the Springboard will restart when feature enabled. 4. This is the step where you will see that 5th column is added and icons are shrunk slightly compared to the 4 column version. If you have some app icons on the other pages of the home screen panel you can remove them manually. 5. All actions of moving and deleting icons are processed exactly the same as how it was when home screen was 4 column layout. 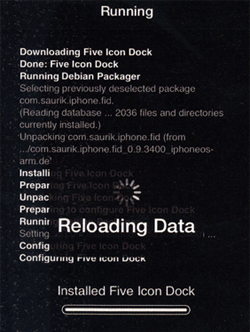 There is also a tweak called Five Icon Dock and combining this with Five-Column SB would be great to fit much more app icons than a single iPhone home screen panel. 6. If you disliked the 5 column layout for any reason it is very simple to disable it in settings as before. As you flick the slider to disable the feature the Springboard will have to restart to return to 4 column layout and items cannot be fitted back on this layout will be moved automatically to the other panel pages.